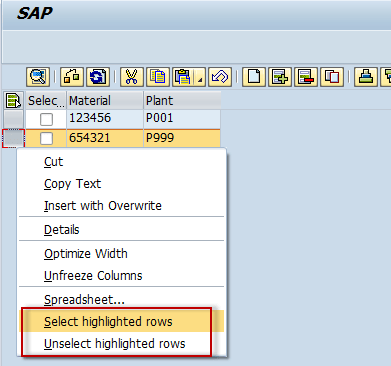 The idea is simple – extend the selection model with separate column to hold the selected/not-selected information. It can be interpreted as a checkbox for example. Selection of rows can now be made either by clicking on check boxes OR by clicking on the row headers + applying a context menu action. Here I’ll provide a sample code how to achieve this. gr_grid TYPE REF TO lcl_demo. mt_data TYPE STANDARD TABLE OF gty_data WITH KEY matnr. APPEND INITIAL LINE TO mt_fieldcat ASSIGNING <fs_fcat>. APPEND INITIAL LINE TO mt_data ASSIGNING <fs_data>. SET HANDLER my_ctx_menu_request_handler FOR mo_data_grid. SET HANDLER my_user_command_handler FOR mo_data_grid. text  = 'Select highlighted rows'. text  = 'Unselect highlighted rows'. LOOP AT lt_selected_rowids ASSIGNING <fs_selrow>. READ TABLE mt_data ASSIGNING <fs_data> INDEX <fs_selrow>-row_id. IF mo_data_grid IS NOT INITIAL. This entry was posted in ABAP, ALV, ALV tutorial, Development and tagged CL_GUI_ALV_GRID, context_menu_requrest, user_command by Spider. Bookmark the permalink.